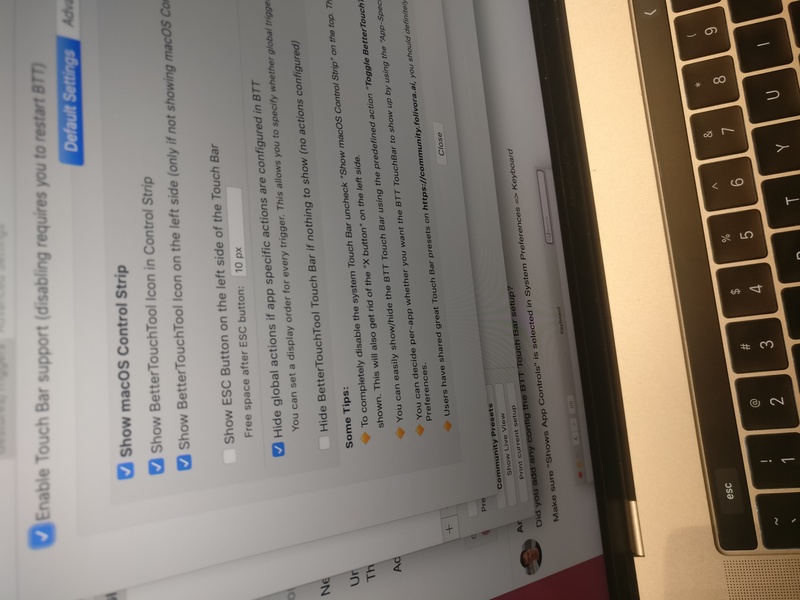 New mapbook pro, Mojave 10.14.3. Installed trial version of BTT. Unchecked touchbar options to show MacOS control strip, and show ESC key. That makes no change to my Touchbar. Added keyboard shortcuts to map to Esc, and Fn- to ` and those works fine. 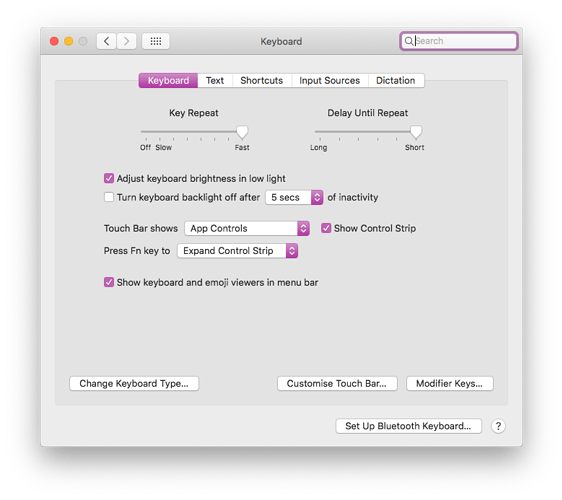 Did you add any config the BTT Touch Bar setup? Yes, that's my configuration. If I hide the MacOS control strip and define my own custom button, that works. But my main aim right now is to disable the Esc button, and remap it to a keyboard key. And that doesn't work. Here you see my config. The Esc button is still shown on the touchbar. @Andreas_Hegenberg, do you have any suggestions? I'm not sure whether I understand. If you can add a button in BTT you can just assign any action and use it as your esc replacement. You need to hide the macOS control strip though if you want to get rid of the left x button. Sorry if I wasn't clear. I am trying to remove the ESC button from the Touch Bar. As you see above, I check "Show macOS Control Strip"
and I UNcheck "Show ESC Button on the left side of the Touch Bar". But with this configuration, the ESC button is STILL showing on the Touch Bar. It that how it is supposed to work? The only way to completely replace this is by hiding the macOS Control Strip. That's my point. The "esc" button is still showing, as you can see here. So this is a bug, right? Do you have any button configured in BTT? 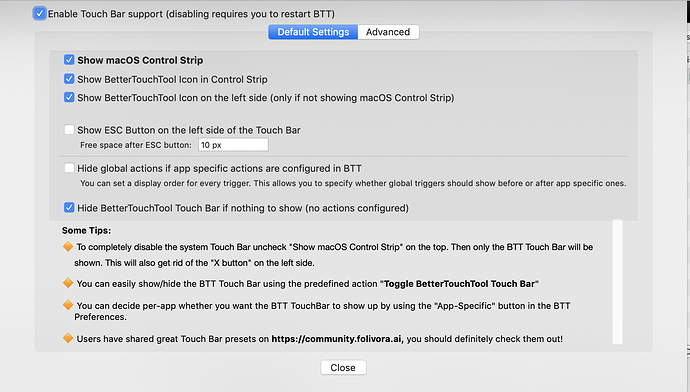 Is your BTT Touch Bar maybe hidden? (unhide by pressing the BTT icon in the control strip or by using the predefined action "Toggle BetterTouchTool Touch Bar). I guess I am misunderstanding how this works. What I want to do is to remove the "esc" button from the touchbar, without changing anything else about how the touchbar functions. Is that possible? BTT only works if at least one button is configured. You could configure one button, assign no action and make it completely black. So I guess the answer is, I can't do what I am asking for, which is to basically keep the MacOS control strip, but with the esc key removed. I'm quite OK with how the MacOS strip works, I just want to get rid of the esc button! Can you send a link? I didn't find presets that seemed designed for this general purpose.